Experiencing depression in recovery – particularly in early recovery – is extremely common. When someone finally breaks free from his or her addiction and begins living a clean and sober lifestyle, it seems as if everything should appear new, bright, celebratory, and exciting, but many people find that they feel just the opposite, and these sad and hopeless feelings, if left unchecked, can quickly lead to slip-ups or even a full-blown relapse. Well, unfortunately, addiction rewires brains and changes the way they work. When someone is an active drug or alcohol abuser, over time, his or her dopamine levels decrease. Dopamine receptors become blocked, and it becomes more and more difficult for these people to feel natural joy and pleasure without the use of drugs or alcohol. There’s actually a name for this condition: anhedonia. While hedonism is the desire for pleasure and the pursuit of it, its opposite, anhedonia, is the inability to feel pleasure – and it’s literally no fun at all. Furthermore, depression can arise in individuals who are new to recovery for other reasons, too. Oftentimes, addiction is a co-occuring disorder, meaning that it is just one half of someone’s problems. 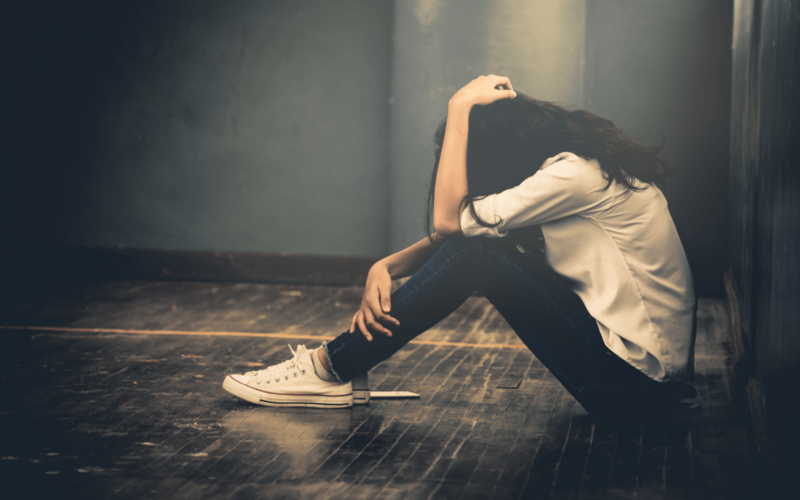 Addiction may develop as a result of other issues an individual faces, and one of the most common issues that goes hand in hand with addiction is depression. It’s likely that someone who is addicted to drugs or alcohol was already depressed to begin with, and was using drugs or alcohol to mask it. Now that that mask has been removed, the depression is back with a vengeance. Lastly, someone in recovery may also feel depressed because he or she is mourning the past. Recovery is a wonderful and powerful thing, but it also involves saying goodbye to a lot of things. For a time drugs and alcohol felt like a friend. Actual human friends may need to be cut off for the recovering individual’s own success. Activities that may have been fun while the individual was actively using may need to be abandoned as well. And, the person they once were when they were using will disappear forever. It can be very intense and difficult to mourn a part of yourself while the rest of you is still alive. Sometimes it’s hard to tell the difference between just feeling a little down and full blown depression, but if you are someone working on your recovery, it’s important that you address any feelings of sadness swiftly. It’s one thing to have a rough day, or two in a row, but if you find that you feel sad and hopeless most of the time for several days or a week at once, reach out to a friend or a professional for support. Although anyone feeling this way should get help, you are at an especially great risk of putting your recovery in danger if you don’t act fast and effectively. If you experience any of the following symptoms on a regular basis, you should seek help as soon as you can. If you find that you experience any of these feelings for more than a few days in a row, seek help immediately. You may find that keeping a journal of your feelings each day may help you to keep track and notice patterns in your moods. Whether you write a few paragraphs, a few sentences, or even if you just rate your day on a scale of one to ten each night before going to bed, a journal can help you, your doctor, and your therapist to determine whether you are just having a difficult time briefly or if you are actually clinically depressed. Although there are some things you can do to make yourself feel happier, if you are truly depressed, you are not going to be able to break fee of it alone. You must seek professional help. Talking to a counselor or therapist regularly will help you to keep on the right track. Your doctor may want to prescribe you an anti-depressant. Although you are trying to stay drug free, there are many effective medications for depression that work and are non-addictive. Remember, they may take a few weeks to start working, so hang in there. Also, it is often difficult for even experienced doctors to determine the correct medication for each patient and to give the proper dosage. Even if your depression seems unbearable at times, stick with it, and once you have a good baseline, things will start to look better quickly. There are also many other things you can do to help work through your depression. Participating group therapy and support groups will encourage you to learn from the struggles of others and will remind you that you are not alone in this battle. Participating in exercise like yoga, running, or team sports can help you feel better physically and mentally by directing your attention elsewhere and through the release of endorphins these activities bring. Getting a lot of rest and quality sleep is also a vital factor in keeping your mental health strong and resilient. Spending time with people you care about can also have this effect, but when things get overwhelming, stepping away from the action and taking time to quietly look inward and meditate can be a great help to you, too. Depression is a beast, a bear, and a huge enemy to anyone who is newly sober. You have to be stronger than it and persevere even when the going gets very tough. Thankfully, there are many resources available to you for help when you need it – you just have to use them. And, are you ready for the best news of all? Damaged dopamine receptors can regenerate in six to twelve months, and once they do, you may be able to feel happy again without any help. You just need to wait it out and know that it will get better in time. Hang in there! You can do it! At Clear Sky Recovery, we offer ibogaine treatment for individuals who are struggling with addiction. Our innovative methods are rooted in the African continent, using medicine drawn from the tabernanthe ibogaplant. Ibogaine has proven successful time and time again in interrupting addiction, and helping individuals who have experienced it to start anew, on a fresh path moving forward, free of the burden of addiction. Our intake specialists are standing by to give you more information about our methods, our facility in Cancun, Mexico, and our successes so far. We look forward to hearing from you, and to helping you begin a new and healthier life. Give us a call today.